Going forward, my site uses HTTPS encryption for greater security. I'm not engaged in eCommerce here, but who doesn't like more security in webbed environs? Besides, my webhost (Reclaim Hosting) made it too easy to ignore. 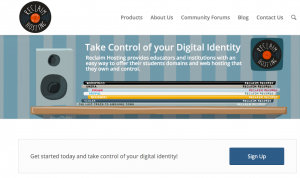 Reclaim Hosting's homepage. Take control is right! I made a few changes to some basic files, activated the SSL Insecure Content Fixer plugin across my WordPress sites, and voilá! Where I had been feeling a little out of touch before, I've now made the move over to secure encryption. My best guess is that https will become relatively automatic in the coming years. Reclaim did most of the work for me by setting SSL Certificates as the default on hosted domains. I just needed to tweak a couple files, add a plugin, and relax. If it's that easy now, it will become even simpler down the road - or so I hope. I can't recommend Reclaim highly enough! Their focus is really on hosting for people in educational environments: students, faculty, institutions. They offer free migration if you have a host. Their customer service is personal, rapid, and robust. These folks even reach out about possible issues they see and suggest adjustments before problems occur.